Home General News The Geordie God of Binchester! 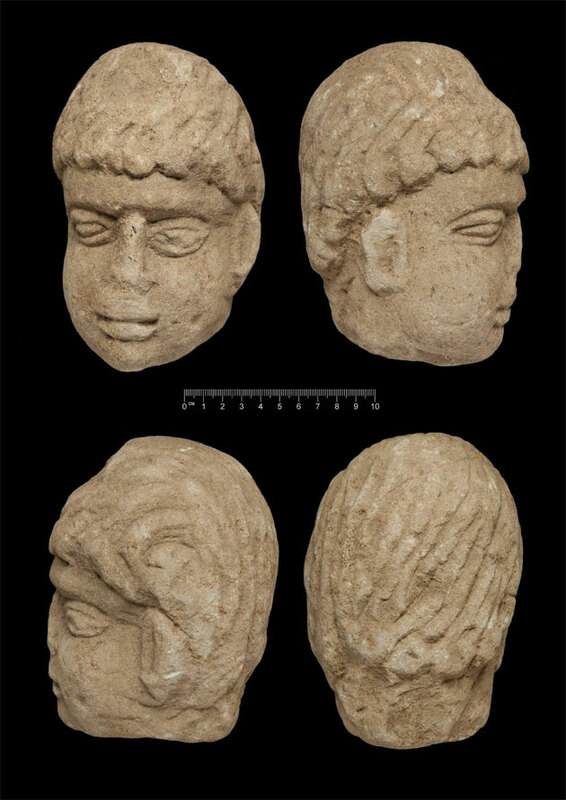 Archaeologists have discovered a stone head – thought to be a of a Roman god worshipped by people in the north east of England. The artefact, thought to be 1800 years old, was found by 19 year old student Alex Kirton in an ancient rubbish dump. Dr David Petts from Durham University has been leading the dig at the Binchester Roman Fort and the report is all over the news. The new excavations of Binchester Roman town in the north of England, running since 2009, are seeking new answers to old questions about the Roman empire and its administration, about the character of military occupation, the life and experiences of locals and the soldiers drawn from the far reaches of the Roman world, about the towns and military outposts built into ancient rural landscapes. The borders between England and Scotland, the “debatable lands”, were once the northern edge of the Roman Empire. In the second century CE the emperor Hadrian had the frontier marked with a wall some 70 miles long, and the garrisons, totaling up to 15,000 troops, controlled a broad military zone organized around forts and a system of roads. To the west of the Pennine Mountains, a road linked Carlisle (Luguvalium) with Manchester (Mamucium) to the south. Forts along its route were spaced about a day’s ride apart and funneled provisions and traffic to and from the frontier. On the eastern side of the Pennines was Dere Street, which began at the legionary headquarters of Eboracum (York) and ran north through the supply-depot town of Coria (Corbridge), at one time extending well into Scotland. The site of Vinovium or Vinovia lay on Dere Street, about 30 miles south of the Wall, guarding a crossing of the River Wear. Its name means “on the wine road” and suggests an important link with the sort of Roman imports valued along the frontier! Vinovium is now known as “Binchester”, “binns” – cattle mangers (Old English) in the ruined remains of the fort – “ceaster”. Binchester has always been known as the site of a Roman fort; the remains of the distinctive fortifications are still visible in the fields of pasture, even when landscaped and incorporated into the grounds of the nearby 18th century manor house. 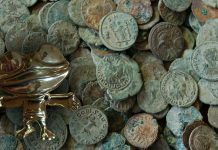 Roman finds, including carved altars and especially coins (locals called them “Binchester pennies”), have frequently been found in the area from at least the 16th century.